What Is the Eating Plan for a Healthy Protein Diet? A healthy protein diet consists of nutritious protein sources such as low-fat dairy products, pork, lean beef and skinless poultry, according to Mayo Clinic. 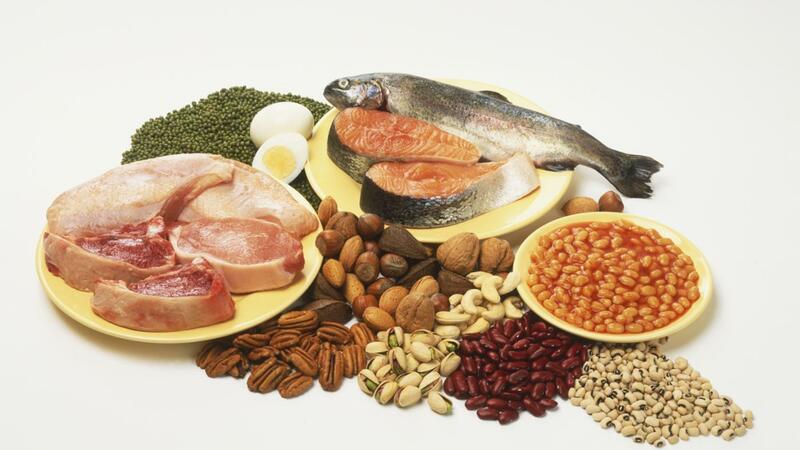 Fish, nuts, beans and soy protein are also good choices. It is essential to choose quality carbohydrates and avoid processed carbohydrates and processed meats. When starting a high-protein diet, doctors recommend choosing fiber-rich and nutrient-dense carbohydrates, especially fruits, vegetables and whole grains, states Mayo Clinic. Nuts, seeds, beans, seafood and lean meats are excellent sources of protein, as they contain plenty of nutrients and low levels of saturated fat and calories, explains WebMD. It helps to add different protein foods in every meal to obtain various types of nutrients, recommends WebMD. For example, a person may eat fish with lots of omega-3 fatty acids, such as salmon, and foods rich in both protein and fiber, especially beans and lentils. Adding almonds to oatmeal and mixing walnuts with salad are also good meal ideas. A healthy protein diet makes a person feel full, therefore aiding weight loss, but the weight loss is often temporary, notes Mayo Clinic. It is important to consult a doctor before starting any diet and to avoid continuing a high-protein diet accompanied by carbohydrate restriction for a long period, as it can lead to health problems such as constipation, headache, bad breath or an increased risk of heart disease. What Is a Good Diet for Gout Sufferers? What Are the Best Foods for a Low-Carb Diet? What Is a Healthy Diet for Heart Patients? How Many Calories Should My Child Eat Every Day? What Is the Role of a Dietitian? How Do Proteins Get Digested? What Foods Should Diabetics Eat?